Nicki Bluhm is apparently traveling through no man’s land when we attempt to connect several times via phone. “If we get disconnected, I’ll just text or call you when I have a signal again. No worries,” she says. No fuss, no pretense, and incredibly cool. That’s the vibe of Nicki Bluhm & The Gramblers, the sun-kissed, roots rockers that are beloved by hippies and elitists alike. Bluhm has been compared to everyone from Linda Rondstadt to Stevie Nicks, but as she explained to The Donkey,finding her voice is still a work in progress. The singer is enjoying the journey, one Sierra Nevada and a few acclaimed van sessions at a time. What’s the best and worst part of playing summer festivals? The best is getting to play for people who are really passionate about music, especially new music. Anyone who spends their time and money to get to these places that they probably don’t live are serious music appreciators. It’s not like they’re there by accident. The challenges are the logistics. For a big festival, you basically pull in your rig and then there’s people who come and drive you to the stage. It’s not as simple as pulling up and loading in your gear. Lots of hard work, walkie talkies and coordination. Sometimes finding your way around is even hard and bands often go on the fly without the luxury of a soundcheck. When you are playing for 5,000 people, you don’t exactly want to dial it in. You want to put on an impressive performance. You are in for a treat with the Newport audience. That’s for sure. Who are you most excited to see at the festival? Rayland Baxter. We’ve been touring with him and he’s awesome. I’m stoked to see Feist too. The band tours a lot. What’s the most important lesson you’ve learned on the road? Hydrate and get enough sleep. There’s a level of normalcy that’s important to maintain since it’s such an abnormal, transient lifestyle. Having your own rituals that ground you is important too. Speaking of being on the road, The Van Sessions are quite the hit. How do you choose which songs to cover? We have a brainstorm session and usually we all tend to agree on one. It’s like, “Yessss!” We’re surprisingly like minded and pretty darn agreeable. It’s never been a problem. We choose one and go with it because we always know there will be more. We’re at twenty-five and counting! Would you ever consider releasing those covers as an album? The audio quality is so poor on those because we use an iPhone, so I’m not sure the integrity is there. That said, people tend to like lo-fi. It’s not out of the question, but nothing is in the works. We’re not sure it’s a good enough product for just the audio to be out there. The Hall & Oates cover has gotten a ridiculous amount of hits. I heard you were trying to track him down at Bonnaroo to share a beer. Did that ever pan out? No beer, but we did end up on a press conference together so I got to meet him, hang out, and take a picture. It was really too early for a beer. Speaking of beer, Sierra Nevada is a fantastic track. Are you guys beer or whiskey drinkers? Beer and always Sierra Nevada! I saw on your Twitter feed that those guys hooked you up while you were down in Asheville. They’re building a second brewery down there that’s supposed to be incredible. They’re big supporters of us and pretty much hook us up with beer drops everywhere we go. It’s nice to have that piece of California with us no matter where we are on the road. It’s part of the consistency and ritual thing I mentioned earlier. When you are drinking a Sierra on stage, you can just close your eyes and be home. Can you share any details about the follow up to the very excellent album, Driftwood? There are two singles out right now that are previewing the record, Ravenous and Little Too Late. We’ve been playing those live. The record is coming out August 27 … or at least I hope so. (laughter). You never know with those things. On a more personal note, when did you realize you had this voice that could blow people’s minds? I still don’t know that. I just keep my fingers crossed and do what I do. I have no vocal or musical training, so I’m just doing what comes to me. Sometimes it works, sometimes it doesn’t. There’s definitely still moments of doubt where I ask, “Am I good at this? What am I doing?” Tim was really encouraging to me and was a singer songwriter that I really looked up to so when he told me I had something good, I believed him. I basically trusted him and kept going based on that. I like doing it and know it’s always a work in progress. Rumor has it that you are a bit of a Deadhead. Confirm or deny? Confirm! For sure. I grew up in the Bay Area with two older brothers. It’s undeniable and part of my DNA at this point. The whole band is actually. 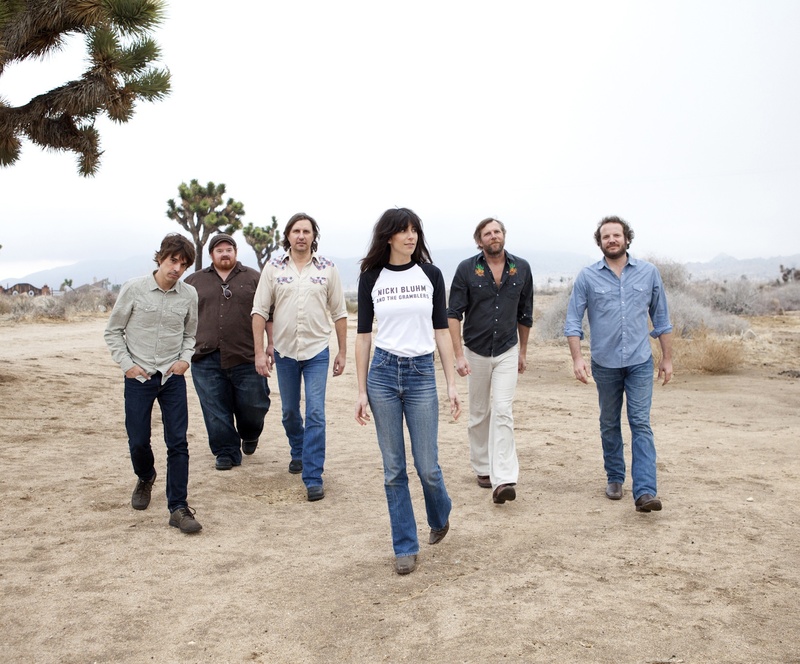 Nicki Bluhm and The Gramblers take to the Fort Stage on Saturday, July 27 at 11:10 a.m.